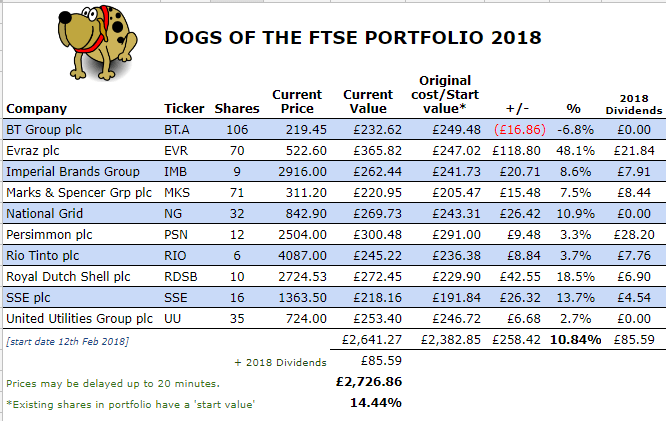 It’s been around 6 months since I set up my second experimental Dogs of the FTSE portfolio, so it’s time for another quick update. Note that this is not part of my main investing strategy, it’s just a ‘fun’ part of my portfolio but any dividends earned are reinvested. So how have these unloved shares done? As at close of trading on 20th July 2018, the portfolio was showing a 10.84% gain from its starting value. Including dividends received, it’s a 14.44% gain. Over the same period, the FTSE 100 Total Return was 7.95% so the Dogs are still looking good on both counts so far. However, since we know that anything can happen to make the markets jittery (trade wars, for example…), I’m not celebrating just yet! Next update in another 3 months’ time! Thanks for sharing Weenie – I love hearing about all these fun portfolios and getting to live vicariously through yours! Every so often I toy with the idea, then I am dragged back to keep it simple land! I’m the same – I’m watching with interest but not brave enough to dive in! Looking good though, long may it continue. Thanks for reading, ladies! It’s only a small part of the portfolio that I don’t mind tinkering with – I wouldn’t follow the strategy if it was money I absolutely needed to rely on! Yes, fingers crossed these gains continue when I come to sell at the end of the 12 months. I do get tempted sometimes to look at dividend investing but then I think no I’d rather stick to my armchair investing philosophy of sticking with index tracking funds. I like how you do it on the side as a bit of fun and interest, that’s brilliant you can do that. Following a strategy like this would be too scary/risky, hence the bulk of my portfolio mostly stuck in index trackers!